The Crustacea are a subphylum of arthropods with 67,000 described species. They are part of the phylum Arthropoda. Crustaceans include crabs, lobsters, crayfish, shrimp, krill and barnacles. They are relatives of insects. If the Arthropods are regarded as a superphylum, then the insects and crustacea would be phyla. (see List of animal phyla). The group has an extensive fossil record, reaching back to the Cambrian. Most crustaceans are aquatic, mostly marine. Some have moved onto land permanently. Crustaceans that live on land include some crabs, and woodlice. Crustacea range in size from a parasite 0.1mm long, to the Japanese spider crab with a leg span of up to 14 ft (4.3 m) and a mass of 44 lb (20 kg). The North Atlantic lobster can weigh more than 40 pounds. Most crustaceans are mobile, but some become sessile after their larval stage. Barnacles become attached to rocks on the sea shore. Some are parasitic, like fish lice, and tongue worms. Crustacea usually have separate sexes, and the eggs hatch into larvae. Crustaceans have three major body parts. They are, front to back: head, thorax, and abdomen. Generally, they have two pairs of antennae, two eyes. The mouth has two mandibles. Most breathe with gills, although certain land crabs have developed lungs. Lobsters and crabs have hard outer skeletons, and tend to preserve well as fossils. As adults, they moult their shells as they grow in size. Most crustaceans crawl along the bottoms of streams, rivers, and the ocean, sometimes coming on land. Because they move along the ground under the water, they are called benthic creatures. Even though lobsters and shrimps can swim a bit, they usually walk along the bottom of the body of water in which they live. More than 10 million tons of crustaceans are produced by fishery or farming for human consumption, the majority of it being shrimps and prawns. Krill and copepods are not as widely fished, but may be the animals with the greatest biomass on the planet, and form a vital part of the food chain. 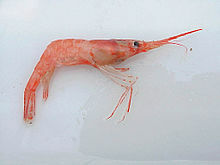 Crustaceans have a number of larval forms. The earliest and most characteristic is the nauplius. In most groups, there are further larval stages, including the zoea (pl. zoeæ or zoeas). This name was given to it when naturalists believed it to be a separate species. It follows the nauplius stage, and often has spikes on its carapace. These may assist these small organisms in maintaining directional swimming. In many decapods, due to their accelerated development, the zoea is the first larval stage. In some cases, the zoea stage is followed by the mysis stage, and in others, by the megalopa stage, depending on the crustacean group involved. ↑ "Cephalon". Crustacean Glossary. Natural History Museum of Los Angeles County. Retrieved 2016-09-10. ↑ "Thorax". Crustacean Glossary. Natural History Museum of Los Angeles County. Retrieved 2016-09-10. ↑ "Abdomen". Crustacean Glossary. Natural History Museum of Los Angeles County. Retrieved 2016-09-10. ↑ Weldon W.F.R. (1889). "Note on the function of the spines of the Crustacean zoœa". Journal of the Marine Biological Association of the United Kingdom 1 (2): 169–172. doi:10.1017/S0025315400057994. http://sabella.mba.ac.uk/16/01/Note_on_the_Function_of_the_Spines_of_the_Crustacean_Zooea.pdf. ↑ Robert Gurney (1942). Larvae of decapod crustacea (PDF). London: Ray Society. pp. 1–306.